CHECKOUT PROCESS IS FULLY SECURE. To have your orders shipped flat rate through the US Postal Service please call 575-621-4220. America's Best Beef Jerky & much more! turkey, chicken or roast of any kind. Scott's Jerky Cures and Brines originated in Klamath Falls, Oregon over 50 years ago. Find out why our customers keep returning year after year for seasoning their homemade beef jerky and smoked salmon. This is not just for beef jerky and smoked salmon. This can be used for any meat, game, smoked turkeys, fowl and fish. 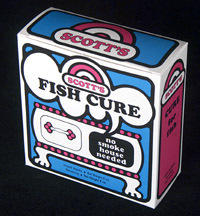 Use Scott's to continue creating memories from your hunting and fishing trips by preserving your catch. Your friends and family will enjoy it year round. For best results in making your beef jerky; Cut meat into 1/4 inch thick slices across the grain. Cut off any fat as it could become rancid. Add Scott's seasoning mix, speed cure ( pink bag), liquid smoke & 1/2 gallon of water to any non-metal, except stainless steel container. Stir to dissolve. Add meat slices and soak for 6 hours in a cold location. 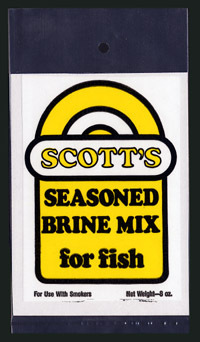 Remove from brine. At this point you should rinse meat and pat dry. Air dry over sink for 20 minutes. Place strips into dehydrator, home oven or smoker. Dry for about 4 hours and then check periodically. Time will differ depending on your dehydrator, oven , smoker, and humidity in you area. Slices should be pliable, not brittle. Place in air tight containers. It's recommended to keep refrigerated and air tight or freeze until ready to eat. Suggested cuts for making beef jerky: Round steak, flank steak, roasts of any kind. These steps are the same in preparing smoked salmon and fish . Easy instructions and recipes are included in the jerky cure boxes for preparing smoked turkeys, appetizers, and roasts. Buy now in time for your holiday menus.